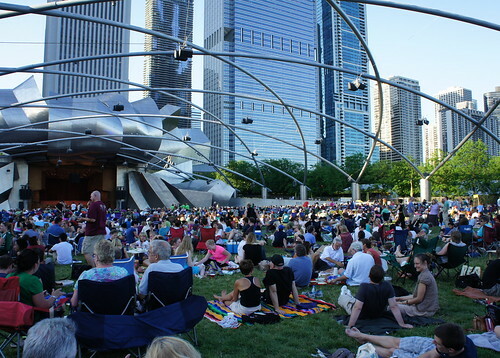 With summer just around the corner that means we Chicagoans will be spending countless nights in Millennium park on the lawn. J is most definitely for Jay Pritzker Pavilion. The Pritzker Pavilion is a magnificent combination of two of the things I love most about this city. It’s an architectural masterpiece and the home of countless cultural and preforming arts events. Designed by famed architect Frank Gehry, the Pavilion is 120-feet high, with a billowing brushed stainless steel headdress. Ribbons of steel frame the stage and connect to an overhead trellis of crisscrossing steel pipes that extend over the great lawn. Now, there are historic limitations on the height of buildings in Grant Park. And 120 feet is too high. But to avoid these legal restrictions, the city classifies the pavilion as a work of art rather than a building. Classic. The Pritzker pavilion is a fantastic venue that makes the arts accessible to the general public and it’s hard to imagine downtown Chicago without this crowning jewel. Do you regularly attend outdoor movies/concerts/events during the summer?